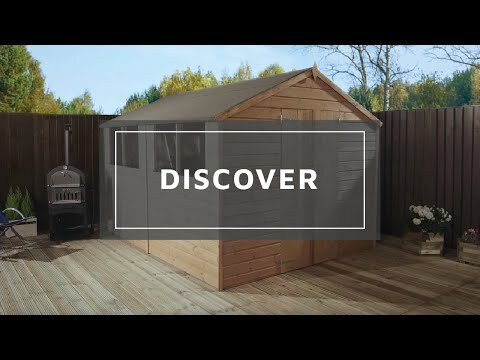 Combining high quality materials with an affordable budget, this Waltons 10ft x 8ft Tongue and Groove Apex Wooden Shed is the ultimate garden storage solution. The open plan storage space provides room for shelving, bicycles, outdoor furniture and gardening tools and equipment. Braced double doors provide easy access into the wooden shed, a pad-bolt is supplied for security. Made from ethically sourced timber, this wooden storage shed is constructed using 12mm shiplap tongue and groove cladding. The tongue and groove construction interlocks together to form robust, durable panels that prevent water ingress. The floor and roof of this wooden garden shed are made from solid sheet board materials and quality sand felt is supplied to protect the building from weather damage. Strong 28mm x 28mm framing provides additional strength to the wooden garden building. Natural light filters through the four styrene glazed windows for easy storing. Shatterproof styrene glazing is a much safer alternative to traditional glass, making this wooden storage shed ideal for busy gardens or allotments. The apex style roof prevents the build-up of rainwater, keeping your items dry from the elements. Complete with a ten year anti rot guarantee, you can be confident that Waltons’ wooden sheds will last and look great for many years to come. Thank you for leaving your feedback today. I am sorry that you have had these problems, I wonder if you have contacted our Customer Service department on 0800 029 1000 who will be able to assist you. Our Reply:Thank you for the feedback. I will pass your comments to the appropriate department. Review:Easy to follow instructions and very good materials used. Review:Good quality item easy to erect and no missing parts. I am thrilled to know that you are happy with the quality of your tongue and groove shed and I thank you again for your positive review. Review:as sheds go .........very pleased!! good quality, easy to follow instructions. Our Reply:It is great to know that you are pleased with the good quality of your shed and that you found the instructions to be easy to follow. Our Reply:I have tried to call you earlier and have left a voice message which I hope you will pick up. If you could call me back when it's convenient on 01636 880514 so I can discuss the issues mentioned in some more detail. Review:The windows are a little cheap and dont seal to well. But otherwise its good. I did phone up and add the lock to this order. I was charged for it, but never actually received it? Our Reply:I apologise for the missing lock and I have been down to manufacturing and we will send this out in the post tomorrow. Apologies for any inconvenience caused. Our Reply:It is fantastic that your tongue and groove shed suited your needs perfectly!